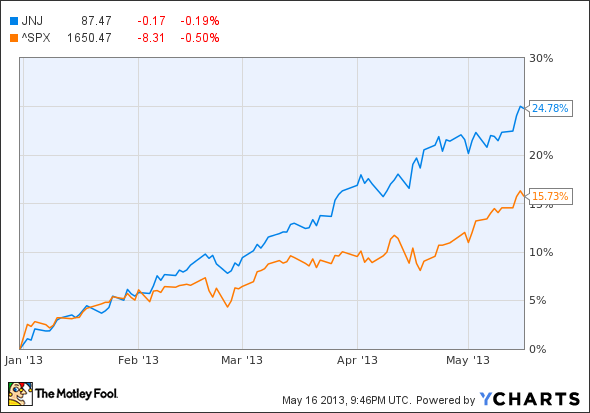 With shares on a steady rise so far in 2013, how does Johnson & Johnson stock look now? Find out in this month's stock checkup. We have checkups for our bodies, our teeth, and even our cars. Why not do the same for our stocks? With that in mind, here is an inaugural monthly checkup for Johnson & Johnson (NYSE:JNJ) stock. Let's look at three key areas to find out J&J's stock health. We won't need any sophisticated algorithms to see how Johnson & Johnson stock is performing. The chart tells the story fully. J&J is handily beating the Standard & Poor's 500 index so far in 2013. Let's also take a look at how Johnson & Johnson stock compares against the broader health care sector, using the SPDR Health Care Select ETF as a proxy. Health care stocks as a whole have done very well this year, so it's no surprise that J&J doesn't outperform the group as much as it has the broader S&P index. However, the company's shares claim a small edge over the performance of the ETF. On this checkup category, Johnson & Johnson stock gets high marks. With such a nice run-up for the year, could J&J shares be getting a little pricey? The trailing price-to-earnings multiple currently stands at just below 24. As the chart below shows, that's close to the highest level since 2005 -- right before the stock took a nosedive. 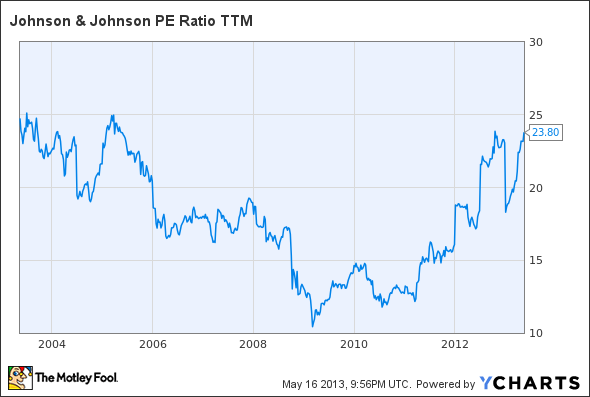 JNJ P/E Ratio TTM data by YCharts. However, the company's forward P/E multiple of 15 doesn't look so lofty. In the stock market, history isn't nearly as important as fortune-telling. We also should look at how Johnson & Johnson stock valuation compares against the stocks of fellow pharmaceutical and medical device companies. 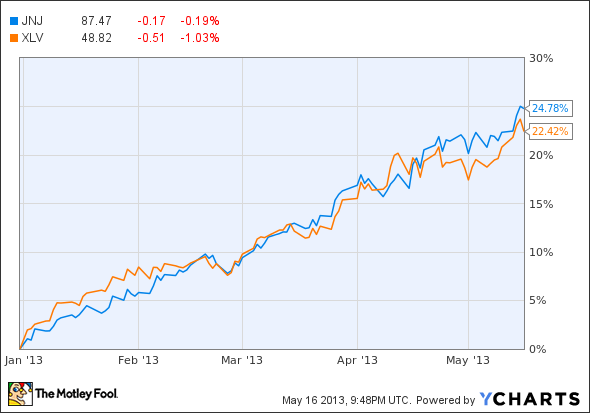 Pfizer (NYSE:PFE) stacks up relatively well in terms of market cap, although it's still below J&J. The idea that J&J is highly valued gets some reinforcement with Pfizer as a benchmark. Pfizer's trailing P/E is 14, significantly lower than that of Johnson & Johnson. The two companies' forward P/E values aren't as far apart, but Pfizer's forward multiple of 12.45 still comes in below its larger peer. Novartis (NYSE:NVS) is another big pharmaceutical company that's at least in the same general league as J&J with respect to market cap. J&J looks more expensive than the Swiss company as well. Novartis' trailing P/E of 19 and its forward multiple of 14 are both lower than those of Johnson & Johnson. It's difficult to find companies that compare well with J&J from a business model perspective. Abbott Labs (NYSE:ABT) shares several similarities, though. Both companies have medical device and diagnostics business segments and both make nutritional products. Abbott also markets pharmaceutical products, but focuses on generic drugs now. Johnson & Johnson stock appears much more expensive from a retrospective view, with Abbott's trailing P/E standing at 11. However, J&J's forward P/E is actually less than Abbott's forward P/E of 16. The problem with all of these comparisons is that J&J's business model doesn't line up too closely with any of them. Standard & Poor's Capital IQ estimates that the fair value for Johnson & Johnson stock is around $79 per share. Assuming this value is reasonably on target, J&J looks to be around 10% overvalued. A little overvaluation isn't necessarily bad when the growth outlook is strong. If J&J continues its momentum from the first quarter, that should be the case. The company reported year-over-year sales growth of 8.5%. That's not bad at all for such a large enterprise. Pharmaceutical, medical device, and diagnostics sales were up by more than 10% with consumer products seeing slow growth of 2%. Analysts expect overall growth between 6% and 7% for this year and for 2014. I think J&J should meet these targets and perhaps exceed them. The medical devices and diagnostics business looks solid. The company does face some challenges with patents expiring for a few drugs, but J&J's pipeline includes potential stars -- particularly ibrutinib. My view is that Johnson & Johnson smells like a rose overall. However, every rose has its thorn. The thorn for J&J is valuation. Shares are priced a little on the high end right now. As long as there aren't any big macroeconomic headwinds, though, I suspect that shares will perform alright for the rest of the year. With a solid dividend yield of over 3%, my opinion is that Johnson & Johnson stock continues to be a good pick for the long run.